The EFF is a non-profit organization whose mission is to foster the advancement of fellows in endocrinology, diabetes and metabolism through mentoring, education, research, funding and career support. A preceptorial is a method of study where a small group of students meets in regular conference with faculty members. There were faculty conferences with Berrie Center Co-Director Robin Goland, MD, J. Merrill Eastman Professor of Clinical Diabetes, who talked about the epidemiology and pathophysiology of type 1 diabetes prevention trials; Ophthalmologist Daniel Casper, MD, PhD, who spoke about diabetic eye disease; Geneticist Wendy Chung, MD, PhD, who talked of monogenic diabetes and stem-cell biologist Dieter Egli, PhD, who conducted a session on novel therapies in diabetes. There was a hands-on session with Berrie Center diabetes educator Courtney Melrose, RD, CDE, MPH,on new insulin pumps, sensors and hybrid systems. The fellows also attended the weekly Tuesday lunch group on unusual diabetes cases. Co-Director Rudy Leibel, MD, the Christopher J. Murphy Memorial Professor of Diabetes Research, spoke to the fellows about the molecular physiology of body weight regulation. 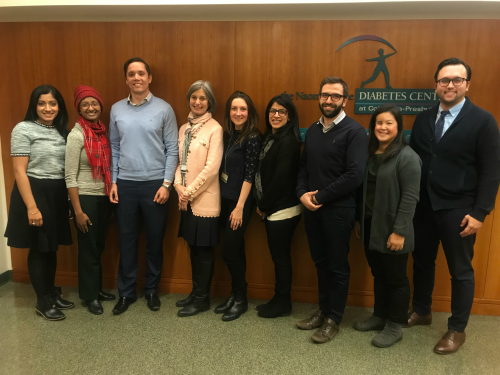 All told the fellows had nearly 30 different learning sessions over five days—and on the sixth day, Saturday, it was the 20th Annual Frontiers in Diabetes Research Symposium, devoted to the biological bases of complications of diabetes.